The four seasons that Josep ‘Pep’ Guardiola spent in charge of the first team at FC Barcelona saw a period of extraordinary football supremacy delivered through tactical richness, ball retention, and player skill. Indeed, for many, the Barça side of 2009-2010 is held up as one of the great teams of modern football: a team that played a possession-based game which bamboozled opponents and delighted soccer lovers around the world. Every few months you could observe the team reinventing itself on the blackboard and on the field, constantly striving to improve and dominate the opposition further. Written by Agustín Peraita, FCBEscola Project Director at Sao Paulo FC Barcelona, this book is for soccer coaches looking to understand and implement Pep Guardiola’s tactical approach and coaching methodology for that 2009-2010 Barça side. Containing more than 50 illustrations, detailing on-field drills, Principles/Subprinciples/Sub-SubPrinciples, tactical diagrams and weekly planning schedules, this practical and to-the-point book focuses explicitly on the preseason period as it lays the foundation for how a team will train, play, and perform over the season. Indeed, regular season training is simply a continuation of everything a team learns and implements during this phase, based on the playing schedule and other resources at a coach’s disposal. The playing philosophy, model of play, associated drills, and weekly training schedule are implemented from day one that the squad assembles. “Play Like Pep Guardiola’s Barcelona: A Soccer Coach’s Guide” provides a theoretical base alongside practical guidance for coaches (even if they do not have elite players such as Lionel Messi, Xavi, and Andrés Iniesta) to develop the ‘play’ that Guardiola developed during his second season at Barça. Incorporating detailed discussion of the Model of Play, Tactical Periodization, the four phases of the game, positional play, and more, a methodological framework is presented that can be used to train almost any proficient football team whether amateur, semi-professional or professional. The book’s foreword is by Ray Power, the author of the acclaimed football coaching books Making The Ball Roll: A Complete Guide to Youth Football for the Aspiring Soccer Coach, Soccer Tactics 2014: What The World Cup Taught Us, and The Deliberate Soccer Practice books. 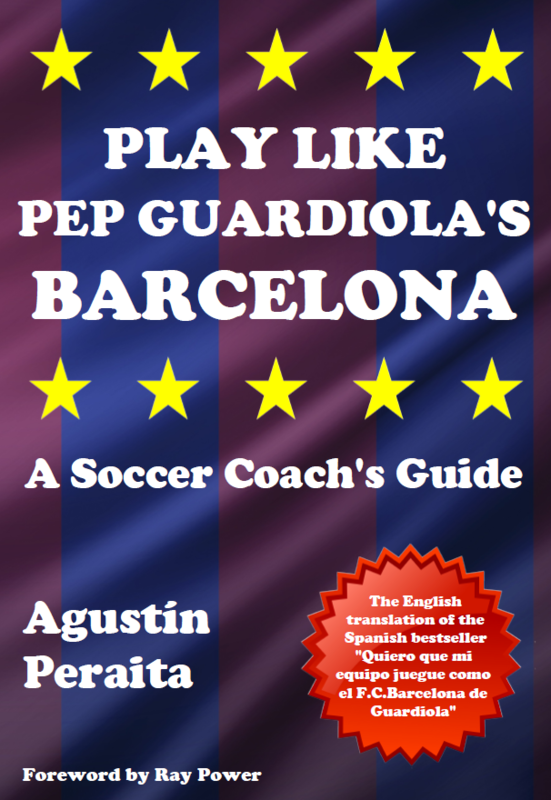 Important Note: “Play Like Pep Guardiola’s Barcelona: A Soccer Coach’s Guide” is the English translation of “Quiero que mi equipo juegue como el F.C.Barcelona de Guardiola (Preparacion Futbolistica)” – the acclaimed Spanish book from 2015. In an effort to remain true to the original version, the English version retains the source book’s depth and complexity which can, at times, make it a challenging read; a certain level of effort and concentration from the reader will be rewarded however. In turn, to get the very most from the book, readers should have a solid grasp of modern football coaching principles. The book provides a rewarding and high value resource for the contemporary soccer coach who wishes to play like Pep Guardiola’s Barcelona. Agustin Peraita is FCBareclona Sao Paulo Escola Technical Director. He is a UEFA Pro Coach and has experience as head coach in Catalan Youth teams such as CE Sabadell, UE Vilassar or UDA Gramanet. The Spanish version of his book “I want my team to play as Guardiola´s FCBarcelona” was published in Spain in July 2015. It is already into its second edition. He is a frequent contributor to Marti Perarnau’s (Guardiola’s authorised biographer) tactical magazine The Tactical Room.